Ohio Artist Ron Anderson discusses his works depicting Ohio's first African American legislator, George Washington Williams. George Washington Williams served in the Ohio House of Representatives from 1879 to 1881. 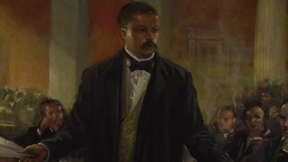 The George Washington Williams Memorial inside the Ohio Statehouse showcases two paintings of Williams created by Ron Anderson. Anderson discusses the process of creating these portraits, as well as some of his other works, including "The History of the Rule of Law", on display on the 11th floor of the Ohio Judicial Center. George Washington Williams was a Civil War veteran and ordained minister who took up the study of law while living in Cincinnati. He was elected to represent Hamilton County, serving one term in the Ohio House. Afterward, he became a respected, published historian and was engaged in the cause of civil justice. He died at the age of 41 while in England.